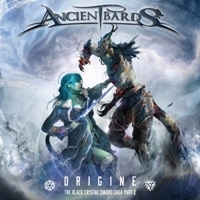 ‘Origine’ marks the beginning of the second part of ‘The Black Crystal Sword Saga’, written by keyboardist Daniele Mazza who founded the band in 2008. The Italian outfit with female singer Sara Squadrani as front lady, writes epic cinematic compositions, relished with orchestration and choirs. Yet it remains fervent and energetic, since power metal happens to be the backbone of the wealthy ornamented songs. The eternal reference to their compatriots Rhapsody Of Fire might be put on ice by now, since Ancient Bards really has a right to exist due to their virtuoso approach of their bombastic music. This fourth album ‘Origine – The Black Crystal Sword Saga Part 2’ appears to be once again a well-crafted saga with cinematic allures. The album opens with the brief ‘Origine’ in which a dark voiced narrator introduces you into the matter. In addition to the symphonic arrangements, we hear a massive choir. One of the voices in that choir is Simone Mularoni who is in charge as producer, also doing mix and mastering of the album. They kick of tight and vigorous during ‘Impious Dystopia’. In addition to the beautiful female vocals, it includes any firm grunts of new guitarist Simone Bertozzi (also known from Empyrios) and that’s a nice new addition in several songs. In the next songs the highfaluting music is often relished with sure-fire neo-classical guitar soloing. In ‘Aureum Legacy’ and the semi-ballad ‘Light’ classical piano adds a kind of sentimental feel. The band always shifts in a wonderful manner between solemn female vocals and cut loose in heavy waters. Orchestral arrangements and choirs are omnipresent to accentuate the cinematic tendency and it speaks for itself that another lengthy epos has been written to divert us. This time the fifteen minutes long ‘The Great Divide’ in which they engross us with all ingredients the band is famous for. Thus highly recommended for every symphonic metal fan! ‘Origine’ markeert het begin van het tweede deel van ‘The Black Crystal Sword Saga’, geschreven door toetsenist Daniele Mazza die de band in 2008 oprichtte. De Italiaanse band met zangeres Sara Squadrani als frontvrouw, schrijft epische filmische composities, aangezet met orkestratie en koren. Toch blijft het pittig, want power metal is de ruggengraat van de weelderig geornamenteerde songs. De eeuwige verwijzing naar landgenoten Rhapsody Of Fire mag nu wel de ijskast in, want Ancient Bards heeft van in den beginne bestaansrecht door een virtuoze benadering van hun bombastische muziek. Ook dit vierde studioalbum ‘Origine – The Black Crystal Sword Saga Part 2’ is een vernuftig in elkaar gestoken saga met filmische allure. Zo opent het album met het beknopte ‘Origine’ waar een verteller met duistere stem ons wegwijs maakt in de materie. Naast de symfonische arrangementen duikt een massief koor op en daarin vinden we zelfs Simone Mularoni die ook fungeerde als producer en verantwoordelijk is voor de mix en mastering. Men schiet strak en energiek uit de startblokken in ‘Impious Dystopia’, dat buiten de mooie vrouwelijke vocalen van Sara enige grunts van nieuwe gitarist Simone Bertozzi herbergt (ook actief in Empyrios) en hij blijkt een mooie toevoeging in meerdere songs. De bombastische muziek wordt in de volgende songs opgesmukt met knappe neoklassieke gitaarsolo’s. Tijdens ‘Aureum Legacy’ en de semiballade ‘Light’ brengt klassieke piano een meer sentimenteel gevoel. Zo weet de band ook steeds af te wisselen tussen waardige vrouwenzang en lekker het tempo hoog houden. Orkestrale arrangementen en koren duiken overal op om de filmische tendens te accentueren en natuurlijk kunnen we ook op die album genieten van een waar epos (een kwartier lang). ‘The Great Divide’ weet te boeien met alle ingrediënten waar de band zo goed in is en dus is dit een vette aanrader voor elke symfonische metal fan. The band always shifts in a wonderful manner between solemn female vocals and cut loose. Orchestral arrangements and choirs are omnipresent to accentuate the cinematic tendency and it speaks for itself that another lengthy epos has been written to divert us. This time the fifteen minutes long ‘The Great Divide’ in which they engross us with all ingredients the band is famous for. Thus highly recommended for every symphonic metal fan!